May 6, 2011 - This week Boeing reported that its Phantom Ray unmanned airborne system (UAS) successfully completed its first flight April 27 at NASA's Dryden Flight Research Center at Edwards Air Force Base, Calif. The 17-minute flight took place following a series of high-speed taxi tests in March that validated ground guidance, navigation and control and verified mission planning, pilot interface and operational procedures. Phantom Ray flew to 7,500 feet and reached a speed of 178 knots. "This day has been two-and-a-half years in the making," said Darryl Davis, president, Boeing Phantom Works. "It's the beginning of providing our customers with a test bed to develop future unmanned systems technology, and a testament to the capabilities resident within Boeing. "Just as follow-on tests will expand Phantom Ray's flight envelope, they also will help Boeing expand its presence in the unmanned systems market." The flight demonstrated Phantom Ray's basic airworthiness, setting the stage for additional flights in the next few weeks. These company-funded flights will prepare Phantom Ray to support potential missions that may include intelligence, surveillance and reconnaissance; suppression of enemy air defenses; electronic attack; strike; and autonomous air refueling. "The first flight moves us farther into the next phase of unmanned aircraft," said Craig Brown, Phantom Ray program manager for Boeing. 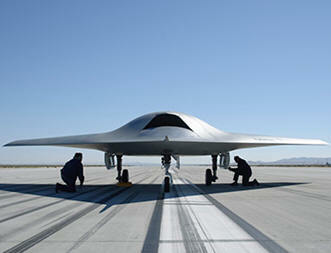 "Autonomous, fighter-sized unmanned aircraft are real, and the UAS bar has been raised. Now I?m eager to see how high that bar will go." Phantom Ray is one of several programs in Phantom Works, including Phantom Eye, that is part of a rapid prototyping initiative to design, develop and build advanced aircraft and then demonstrate their capabilities. Boeing's portfolio of UAS solutions also includes the A160T Hummingbird, Integrator, ScanEagle and SolarEagle.